Interested in taking a flight without worrying about the engine blowing out? 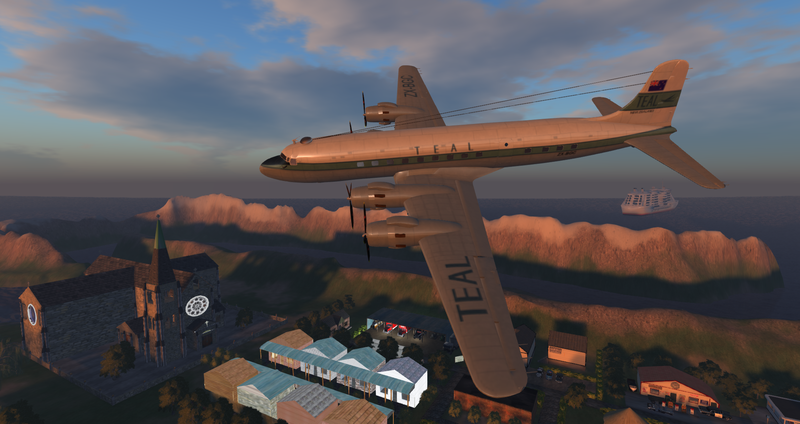 You can now fly virtually, on an airplane filled with other passengers, on the Kea Nation  enclave on the DigiWorldz  grid. Kea Nation has brought in several airplanes recently, including the KNVV Douglas DC, which can carry up to 12 passengers. “The first test flight on the pre-release model, I flew every variable-sized region in Kea Nation,” Kea Nation owner Don Hayward — also known in-world as DA Admiral — told Hypergrid Business. The Kea Nation enclave is comprised of a 127 linked variable-sized regions, with a combined total land area that’s the equivalent of 2,032 standard-sized regions. The vehicles are available for purchase in DigiWorldz from Virtual Vehicles. They work with any OpenSim version from 8.0.0 to the current and while DigiWorldz uses Bullet physics engine, the vehicles can also work on UbODE and ODE also, DigiWorldz representative and content creator Noxluna Nightfire told Hypergrid Business. Compared to Second Life, the vehicle has more room to move in OpenSim due to variable-sized regions. Second Life regions are all one standard size. The airplane is stable and flies better than similar vehicles in Second Life, she said, she said. “Personally, I find the aircraft smoother to fly and crossings between linked regions are more reliable,” she said. The model is created by TR Lifter, who is a professional 3D artist and was commissioned for Kea Nation. The meshes are made by Mark Rowles who is contracted with Hayward to be his authorized representative. “I have a small but enthusiastic client base scattered all over the globe, and my New Zealand representatives are based in a DigiWorldz realm known as Kea Nation,” Mark Rowles told Hypergrid Business. “They have a passion for flying and aircraft, and I have been working with them now for several months, building NZ-used aircraft from around the world and through time. There is nothing more satisfying for me than seeing my creations flying around in a realistic environment by other lovers of vintage planes. Go and check them out. The aircraft will also be available for flying during the ANZAC day, which kicks off at 10.a.m. on April 24 in Kea Nation. April 24 is a national day in Australia and New Zealand meant to commemorate Australians and New Zealanders who served and died in all wars, conflicts, and peacekeeping operations, as well as the contribution and suffering of all the people who have served. Kea Nation will do a memorial flight and also host a war planes flight. The hypergrid address is login.digiworldz.com:KN TUI. It suits for OpenSim social events and fun flying inside and across grids but also opens the door to new types of role play gaming. The same approach can be used to hold a traveling party on a cruise ship that goes from region to region. That is the next project for the team. The DigiWorldz’s team tested it recently and managed to cross 18 regions. One challenge with these types of vehicles is that they cannot travel between grids. Currently no vehicle of this type has been able to go from grid to grid, or sail through hypergates, said Nightfire. There are other multi-passenger vehicles sold in OpenSim, such as this six-passenger Oriental Pearl Sailboat , sold by Ocean Engineering  on the Kitely Market . However, while there are a few airplanes in that online marketplace, none of them seem to be large, multi-passenger airlines like the one on KEA Nation. Copyright © 2009 Hypergrid Business. All rights reserved.